The greatest risk in life..
..is not to take a risk at all. This is one of my favorite quotes. It makes you trust, hope on something and go for it despite the uncertain outcome. The subject line perhaps describes my state right now. I was at one of the major crossroads of life, wondering what path to take. The decision was perhaps the hardest I had to make. It was a HUGE change for me and everyone that knew me for a quarter century. It was a decision that was parting me and my loved ones – my city, family, people i knew, my hobbies and many more. It was a decision that moved me out of the most comfortable possible comfort zone. The decision that would put me in enormous pressure in many ways – mentally, emotionally, and financially. The decision was to pursue MBA in the US. Here I am blogging from Los Angeles, California. The orientation program starts tomorrow and I’ll be studying at the Marshall School of Business at the University of Southern California. There sure would be some new experiences this decision would bring about. There are many firsts. I know I’d be crippled in many ways – living without a car (especially in a country such as this), living with a thought of budget in mind, renting a house to live and cooking myself. It’s a different experience. Have to wait and watch where this takes me. I’d continue writing on this blog as this has already gone through some drastic changes from its inception. Started as a pad for scribbling random thoughts, transformed to a travel and wildlife blog, and now that of an MBA student. It’s disappointing that I might not be able post about my wildlife escapades much now on, but I have a stockpile pending that I’d post whenever I find time. But It won’t be much. For those that want to unsubscribe, hope to connect in future. For the rest, stop wondering what a sellout and wish me luck. Continuing the tradition (2007, 2008, 2009) of cryptic end of the year post, here’s this year’s account. Definitely the most traveled year, not necessarily distance-wise. Kick starting with small, serene sanctuary and culminating in the ravines of a notorious river. A year of incredible highs and abysmal lows. Unexpected invite. Fun and frolic. Denied attempts. Super meet and an awesome race. Eager expectations ended January. A smoother sail, or so it seemed. More accesses denied. A silver lining – totally unexpected. Impulsive decision and the visit. Exceptional beginning. Sulking in the experience. Eye on longer plan. Sense of troubled immediate future. Trouble. The search. The exciting discussions. Search. Unexpected offer. Confusion. More offers. Pseudo expectations. Lots of trips. The end. Confusion. Price paid for expectation. Agony. Annoyance. Escape to hell with short sight. Smooth beginning. Getting stuck. Getting it out in the favorite place. Fun. Effort. More realistic approach. Lot of effort. Chill. Opportunity. Lessons and anticipations. Missed November post. Macaqueing unleashed. Acceptances. More scope for opportunity. Cold and the wonder. Decision making in the process, on both ends. Third year this. Continuing the series. Kick started with a fantastic January, and rode one hell of a roller coaster – traumatic and euphoric year. Few firsts, and few not firsts. Will try to keep it cryptic. First time racing with 4 unknowns – yeah, i loved it. Off and on roading, without a license. Exhibiting, selling, learning lessons on costing, networking – and more importantly having fun. More and more travels, and fighting sleeplessness. Tweeting. The program – close, yet so far. Hectic and crazy beginning – not realizing the mammoth impact of future. Postponement. Plan goes awry. Cushion of buffer, but a price to pay. More frustration, plan goes awry again coz someone didn’t do it right. Almost an exit. An opportunity – perseverance and patience pays – an experience. The stint. King reins – didn’t witness. Hit a low again. Confusion, leads to determination. Final frontier. On par – can fight with. Decide to fight. Fighting starts – planning of which was on and off. Revelation by the one. Lobster gone. Disappointment, loss of joy. But. Fighting continues, and so does living on hope. The time of life when you plan something and life plans something else. I was hoping to post a series of images from Bandipur, get hands on my new possession, and met some nice people in Bangalore. But i landed up in 51°27’0″N / 5°22’28″E. Took 4 different trains from Frankfurt to Eindhoven, with a stop over at Köln and caught up with a college friend there. 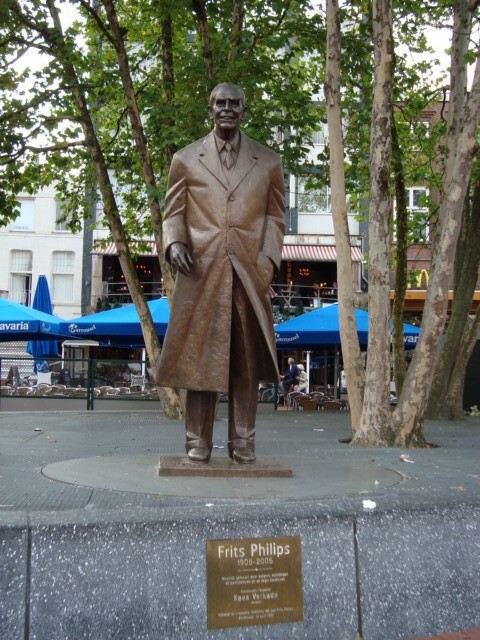 Eindhoven is non-existent but for Philips, and the statue of the man himself is at the city center. P.S. : Trying to catch US open, more later!